Moles represent or stand in for other quantities. One such quantity is mass. The atomic mass (for for an element) and the formula weight (for a compound) are equal to a mole. 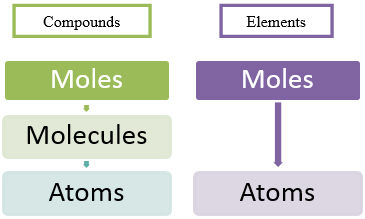 NOTE: atoms and molecules are different and moles will therefore represent different quantities depending on if you have a compound or element. What is “x?” The number of atoms or molecules equal to one mole is called Avogadro’s Number, and its value is 6.022 x 1023. Do these look familiar? They should—they are conversion factors! Use the proper Avogadro’s number conversion factor and dimensional analysis to solve in one simple step. Example: How many molecules are in 3.5 mols of CO2? So what if you have to find the number of molecules beginning with a mass rather than moles? Simple, just one more step. There are __________ molecules in 130 grams of C6H12O6? You can find the number of atoms of a particular element or all elements in a molecule of a compound. For example, in CO3, there is 1 atom of C and 3 atoms of O or a total of 4 atoms altogether. In C6H12O6 , there are 6 atoms of C, 12 atoms of H, and 6 atoms of O or a total of 24 atoms in the entire molecule, etc. These are also conversion factors. Let’s try an example, using conversion factors and dimensional analysis. How many hydrogen atoms are there in 130 grams of C6H12O6?